One of the great things about a well-written cookbook is the learning of new techniques and their application to new flavor combinations and dishes. The humbly-named Grapefruit Pie recipe from Momofuku Milk Bar cookbook is actually a fairly sophisticated recipe, with a Ritz Crunch crust, a passion-fruit sabayon with individual grapefruit threads as filling, all topped with a key lime pie-like layer of thickened grapefruit-sweetened condensed milk. Chef Tosi writes that they tried many different flavor combinations in their test kitchen, and grapefruit was the winner, and so we readers get the benefit of the all of the chefs’ experimentation in the test kitchen. All of the techniques are very well explained, making them doable in a home kitchen with no special equipment required except for a blender. First there is the Ritz Crunch as pie crust. Ritz Crunch uses one of Tosi’s signature techniques of transforming a store-bought ingredient into something uniquely hers. It’s really simple: mix crushed Ritz crackers, sugar, salt, and milk powder, then bind together with butter and bake. The ratios of ingredients just works, and the resulting Ritz Crunch is like a sweet, buttery, crunchy Ritz Cracker candy that is insanely delicious. It’s used here as the pie crust, but it is good by itself just to snack on. The passionfruit-grapefruit thread filling is really interesting. Passionfruit puree is mixed with sugar and an egg is whisked in over low heat to incorporate air and thicken the mixture. Then gelatin and cold butter is cut in using a blender. This is, I think, an easier variation on the sabayon method where egg, sugar, and citrus is whisked over a double boiler and butter is then whisked in. For the grapefruit threads, sections of grapefruit are cut away from all of the pith and membranes. The individual threads are loosened over low heat and mixed in with the passionfruit mixture. 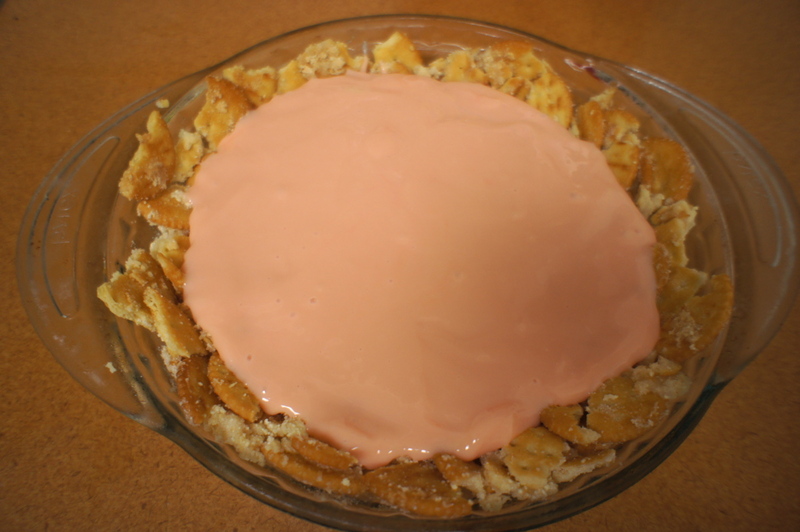 The topping is pretty easy, a mixture of grapefruit juice, sweetened condensed milk, salt, and citric acid. The citric acid provides tartness and helps thicken the mixture, which is similar to key lime pie filling with the use of sweetened condensed milk. Citric acid can be ordered online or can be found at specialty baking shops like Spun Sugar in Berkeley, CA. Regular grocery stores such as Safeway or Trader Joe’s do not have citric acid. In the finished pie there is nice contrast between the sweet Ritz Crunch crust and the tart layers of the pie. The grapefruit threads are a really genius addition that provide little bursts of flavor and textural contrast. The Grapefruit Pie recipe is a nice example of the creativity and deliciousness that is beautifully illustrated in this book. I appreciate the photos & commentary. I also made this recipe and was caught off guard at how little the condensed milk set up. I was picturing a pudding-like consistency. Mostly because like you, the amount of filling looked far too scant for a 9.5″ glass pie dish and I was hoping to double it for more volume. But while the passion fruit curd tasted wonderful, the condensed milk-grapefruit-citric acid did not taste good, IMHO. If I were to make again, I would double the curd or use a pie tin.